This year brought one of those “monumental” anniversaries of my high school graduation. Since we hadn’t gotten together as a class since our tenth reunion, a couple of us decided to plan a gathering to mark this occasion. I’m guessing that somewhere in this post, I’ll slip and say which class reunion this was. Maybe. There were 23 in my graduating class, and I contacted all but two of our classmates. 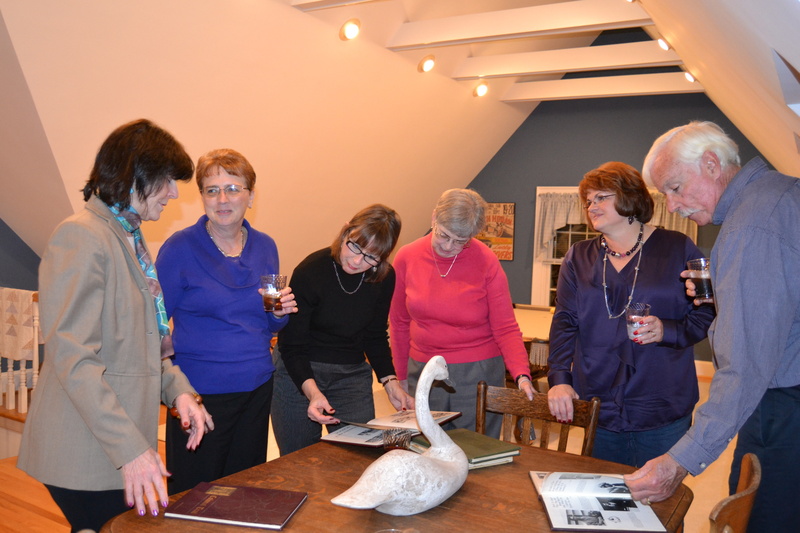 Ten were able to attend the reunion Saturday evening. 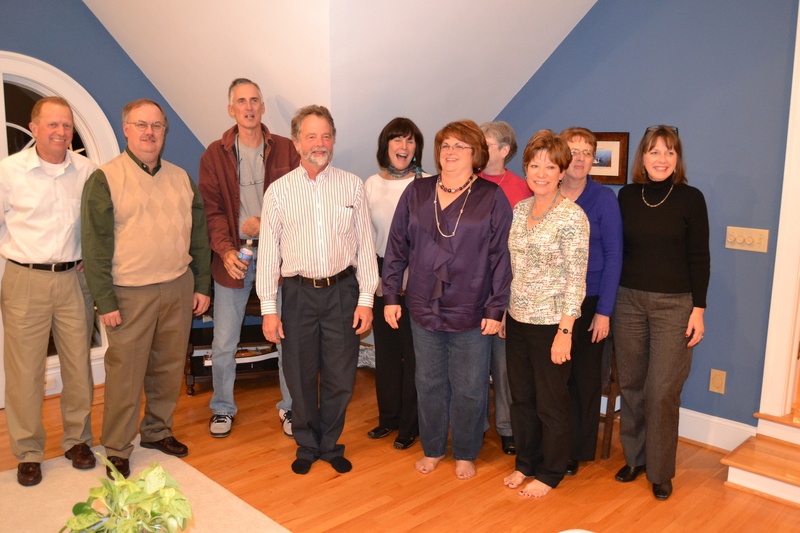 We met for dinner at a local restaurant, and then everyone came to our house to spend more time visiting. We looked over old yearbooks. We had a few laughs. Motor Man chatted with my classmates. 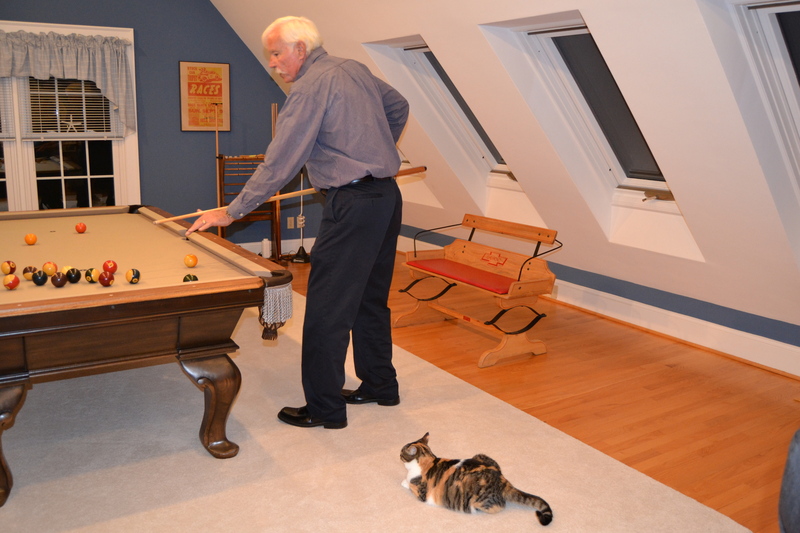 By the way, the guy playing pool in that picture? His name is Dan, and he was my date for the senior prom. He was a year older than me and had already graduated. 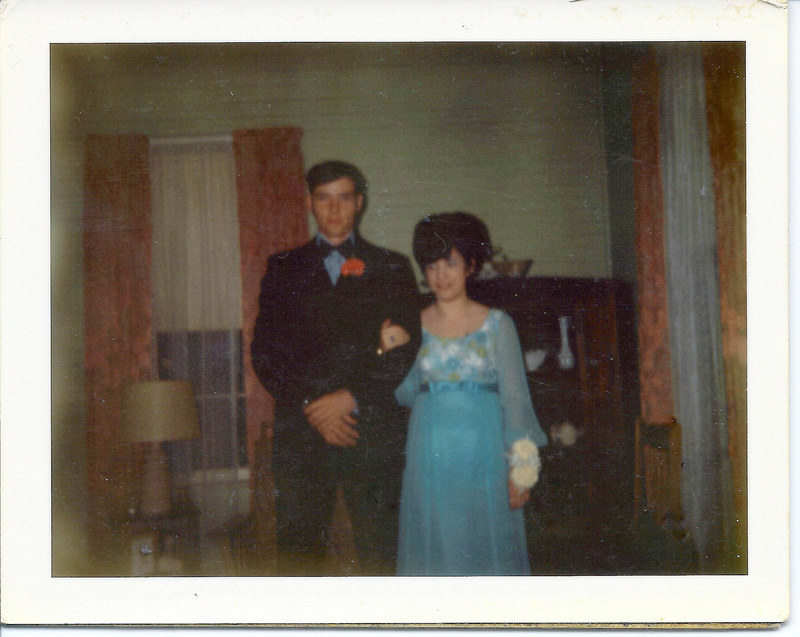 But we had grown up riding the same school bus and attending the same church, so he agreed to be my date for the prom. Yes, folks, those were the days of bouffant hair-dos and wrist corsages for special occasions. Dan went on to marry Diane, one of my classmates. While were were looking at yearbooks Saturday night, I brought out this old prom photo, and we decided to re-enact it (minus the hairdo and corsage). But, this time, we included Dan’s wife. And, as you can see, there’s Sundae, not missing a thing. Oddly enough, the boys in our class always sat on one side of the room, and the girls sat on the other; even in our senior home room class. We re-enacted that too. And then we ate cake. Oops. Told you I’d slip. This entry was posted in Days at Home and tagged class reunion. Bookmark the permalink. You contacted all but two? That’s amazing. Back in the 80’s I was disconcerted that I was listed among the “lost” of our class. I was sure to go to the next reunion and get the info updated. btw the way I met an ole class friend there who we both found out at the time lives just 5 miles from me! We always have lunch every month or so, and sweet thing she weighs in on my blog. Happy times, Dianna, and you look so very comfortable barefoot. At my 40th reunion,I was amazed at how everyone had aged except me. I see the same for you in these pics. You are certainly the youngest person there! 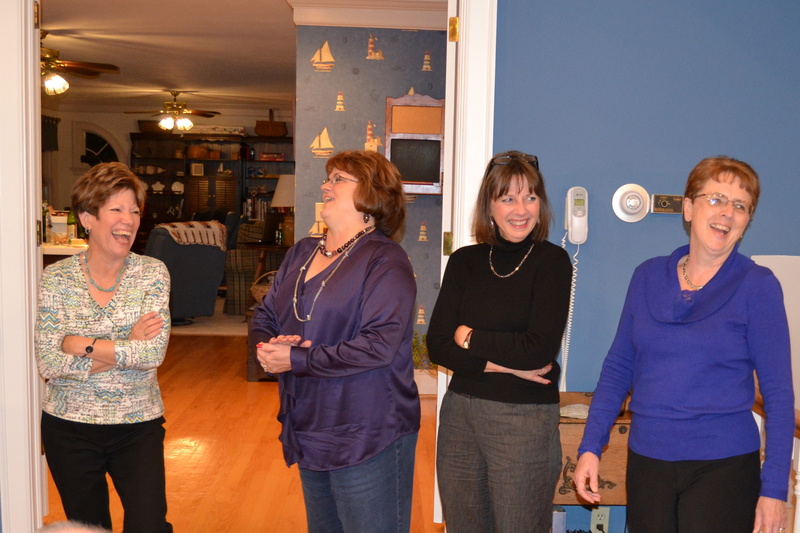 Somehow I just knew the “**th” Reunion would show up in your blog!! 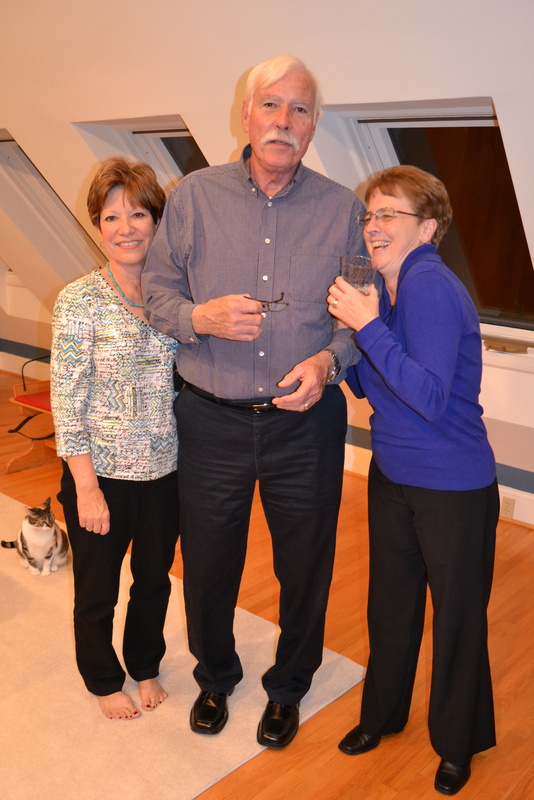 It was a great evening….so much fun!! 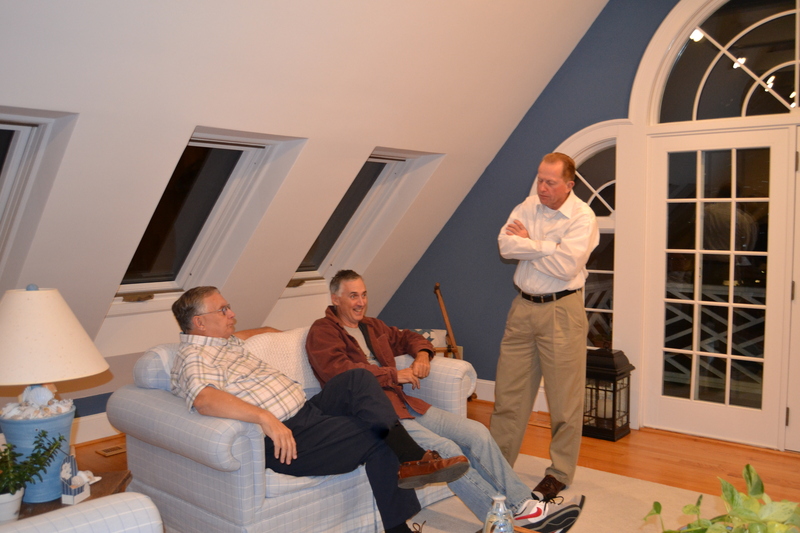 Thanks again to JR, you & Sundae for hosting the after dinner get together….that was the best part!! Digging the hair do! You guys look fabulous! I had no idea Sundae was such a busy little body! Great post Dianna, fun to see you all having such a great reunion! You and Barb sure take after Mom…as soon as you get home, the shoes come off. Looks as if everyone had a grand time. What a wonderful thing to still be in contact with your old school mates. Your house looks lovely. I love the slanted walls and white doors / window. Beautiful. Looks like everyone had a wonderful time. Your home is beautiful! What fun!! I’ve only attended one reunion. Mine was the class of ’59, so we’ve had our 50th! Your home is beautiful! What a blast! I’m still smiling. Took me a while to get up the guts to reconnect with high school friends – but I have been a little at a time! What a nice thing for you to organize this night out! And your home really is lovely!! Looks like fun! I’m a barefoot girl, too. There were nearly 300 in my graduating class; and I’ve never gone back for a reunion. Looks like everybody was having a good time … hard to say who was having the most fun, but Sundae’s participation in the prom re-enactment photo is cool ..! I love everything about this post…from you re-enacting your memories to Sundae looking everyone over. Looks like a great reunion…and your house is just gorgeous, too! That was wonderful! I’ve gone to a couple of high school reunions but none of them looked as lovely as yours must have been. You all look like you are having a fun and relaxing time together — especially Sundae! 😉 Your home is as warm and inviting as your blog (and obviously, YOU!). Thanks for sharing with us AND slipping on the **th reunion. I’m not far behind you! Looks like a good time was had by all. You must be a fabulous hostess. Looks at all them smiles. Looks like a good time had by all. 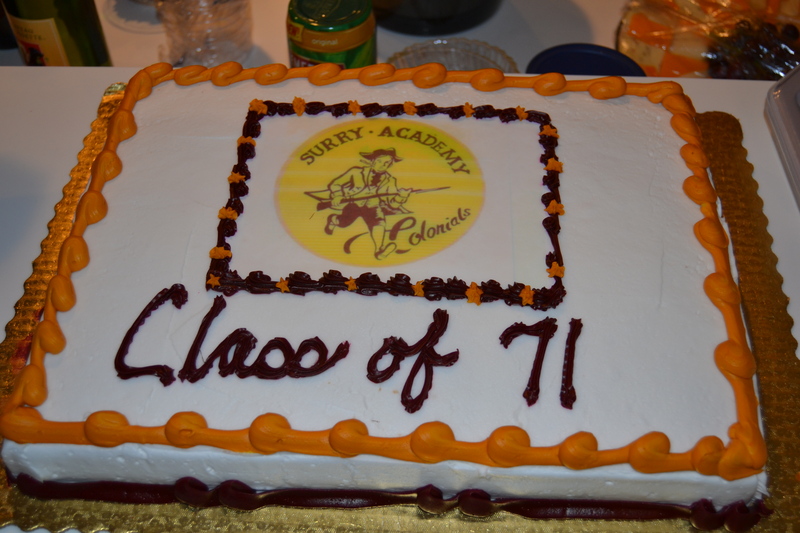 I must admit there’s still a part of me that wishes I could have stay in Surry and graduated with you guys. Lona and I graduated in a class of about 100, if I remember correctly and I made some good friends but I guess my heart has always been in Surry. I believe I’ll take a guess and say you like the color blue. I think the painted blue walls and blure prom dress and , maybe, a little blue in your blouse. Isn’t it amazing how we tend to gravitate to colors we feel good about?? Thanks for letting me into your class reunion. You’re just a youngster! What a lovely evening. I enjoyed reading your story and seeing the photos!